A few months after it went live in France, Google Play Movies is now available in neighboring Spain, as it continues to slowly make its way across Europe. Google Play announced the launch on its Google+ page, noting that people in Spain can now buy popular titles such as Fuga de Cerebros 2 and El Sueño de Iván through the store. Although there's no time frame for the launch of Play Movies in other parts of Europe, you can be sure that the service will be on its way to countries such as Germany and Italy fairly soon. 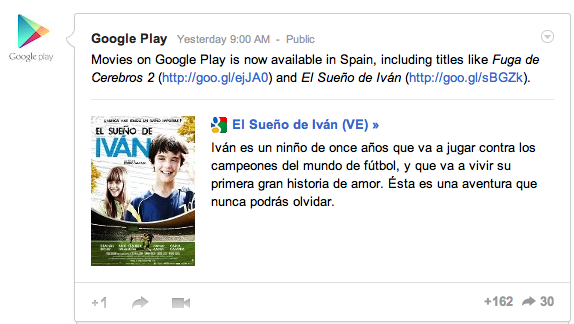 If you live in Spain, you can now download movies right now from play.google.com and your Android phone.